I started working in the landscape industry in 2000. Over sixteen years later, I’m in the same business because I love what I do. I enjoy supporting my crew on projects big and small while delivering an impressionable landscape that our clients can be proud of. 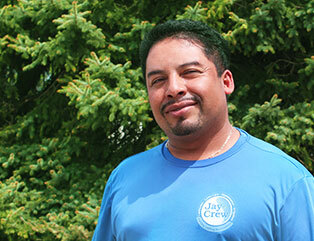 As Property Superintendent, I work as a team with Jay-Crew Relationship Managers on each account to develop proactive maintenance programs that add value to each property. I am responsible for working directly with clients to ensure their expectations for property maintenance are exceeded. I direct and coordinate Jay-Crew foremen and crews, establish quality control measures, ensure a high level of service, oversee use of equipment and materials, and assist personnel as needed in carrying out their responsibilities with honesty, pride, and professionalism. Originally from Mexico City, my family now calls Huntington, Indiana home. I enjoy fishing and love soccer, especially my favorite team – Club America.